One of our favorite green public artists, Edina Tokodi, is at it once again with her shape-shifting moss graffiti and urban guerrilla tactics. 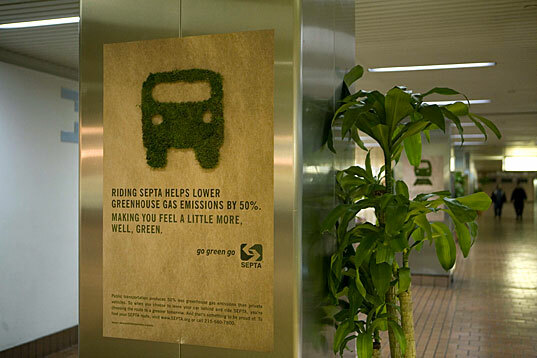 Tokodi was recently commissioned by SEPTA (Southeastern Pennsylvania Transportation Authority) to encourage Philadelphia’s commuters to ‘Go Green’ with her navigable moss icons and green walls in the Market East Station’s passenger service area, ticketing area, and on the exterior of the station building and Transportation Museum. The initiative is part of SEPTA’s mission to help commuters become more aware of the positive environmental impact of using mass transit regularly. Philly’s effort to ‘Go Green’ via ‘moss transit’ might be just the way to start another American Revolution. We hope that other cities nationwide will soon be eager to get on board and take the green express as well! In a recent interview with Edina, the artist described that the ‘Go Green’ project took approximately one month of materials preparation. The installation’s opening coincided with the Philadelphia Flower Show, a popular time for increased traffic to and from the city. The artist and her collaborator, Jozsef Valyi-Toth, used “100% natural sheet moss”, turf-like plant matter grown explicitly for decoration and design purposes. Given that this material is already well-preserved, the exhibit’s pieces will remain green for at least a month and a half. (Additional watering apparently makes the work brighter green and puffy in texture.) It is a goal of the artist to soon employ bio-matter that requires dedicated watering, nurturing, and ongoing cultivation. The actual installation of the moss icons and signage took one week of working non-stop, around the clock. This included creating custom-fitted moss inserts for 32 SEPTA posters (10 inches by 10 inches) and 40 pieces that fit into the SEPTA logos throughout the site. Edina and Jozsef also made two ‘Go Green’ signs with each letter measuring 2 feet by 3 feet. Red Tettemer, the very hip advertising agency, also lent a hand in the communication design details for the project (check out the very cute video of the project’s installation process on their website). The ‘Go Green’ project seems to already have won over the hearts and minds of day-to-day commuters at East Market Station. According to SEPTA, the feedback thus far has been extremely positive with Tokodi’s moss icons being one of the most creative projects they have helped sponsor in a very long time. It might be a while before we are able to grow vertical gardens and vegetable walls ala Patrick Blanc in ‘the underground’ or along the train tracks so to speak, but eco-minded public works are here to stay, and there may soon come a time when being on the ‘go-green-go’ may be one of the most-energy efficient and civic minded activities that we can collectively participate in. Not a marketing ploy. SEPTA is the best in the nation. Very efficient, the most green, and uses the heaviest and best equipment. Unlike MTA which leaches off the gvmt, has a huge defecit and operates in a awful city, SEPTA runs every mode and runs flawless. I am very impressed with the novelty and cleverness of the campaign. It's very catching and exciting and fits well with the spirit of Philadelphia's art scene. However, I can't help look back about four years to my college days, watching Septa's recycling bins being emptied along with the garbage cans into one big truck. Obviously, going green is more of a marketing ploy for them than an ideology. I suppose I can hope that those practices have changed...but I'm not holding my breath. A Big Pacsi from Budapest to Edina & Co. for her awesome moss project. I do wish that someday the mindless scumbags responsible for running (sorry: ruining) the transportation networks of Hungary today will also realize that a similar change in mindset is essential. I can't wait to see moss on my beloved 4-6 tramline.. Goddamn these look soo cool! Anything they can do to make Market East less ugly is a welcome step. The platform murals are a nice touch, but there's not a lot going on anyplace else in the way of visual splendor. Relax -- it's Philly. It's a fun city that has a terrific partnership with the creative community. What's to complain about? It's a city with an excellent mass transit system and it's nice to give folks a pat on the back for their commuting habits. I used to catch the train at Market East all the time when I lived in Philadelphia. Beyond the greening message, I love that the station is greener in color too. It looks friendly and welcoming - not something I see in many train/subway stations. Lighten up people! I think it's great. A step in the right direction toward the green walls. The last thing this environmental "movement" needs is more bah humbug attitudes. You got a better idea, don't tell me, go DO it! Great way to move attitudes to thinking about the good they are doing. When is the last time someone pat a bus rider (or train rider) on the back for helping keep the planet less polluted? First time I've seen it. Go Philly! Better to do something that may not be enough yet than to do nothing or worse yet, criticize others while doing nothing. @Unimpressed: What is so special about a guy selling some CDs? Really? CDs are terrible for the environment from their birth and through their entire lifespan. So actually, I guess it is special- he's noteworthy for failing to adopt modern practices of publishing music digitally, and through his ignorance he's perpetuating the pollution of our planet. Art that destroys! Great job, there. Really. What's special about moss installations in an unlikely area such as this is that it's an uncommon practice, looks awesome, and people notice it because it's a new thing- don't you think that's kind of special, since it opens more people's eyes to thinking about our environment, and learning to enjoy it? I am a SEPTA rider. The station is called "Market East", not East Market. I saw these displays firsthand. What is so special about gluing plant matter on signs? Really? The real story at Market East Station last weekend was the blues guitarist hustling some CD's. THERE is your East Market Artist. One of our favorite green public artists, Edina Tokodi, is at it once again with her shape-shifting moss graffiti and urban guerrilla tactics. 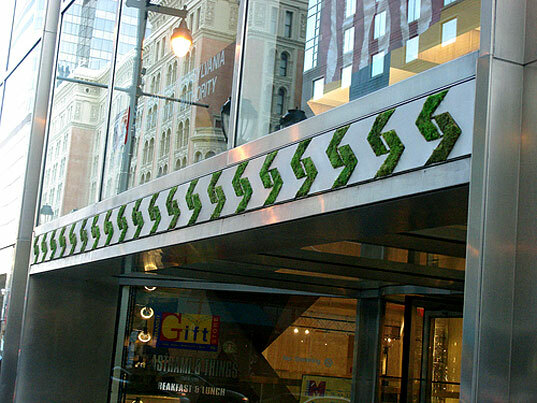 Tokodi was recently commissioned by SEPTA (Southeastern Pennsylvania Transportation Authority) to encourage Philadelphia's commuters to 'Go Green' with her navigable moss icons and green walls in the Market East Station's passenger service area, ticketing area, and on the exterior of the station building and Transportation Museum. The initiative is part of SEPTA's mission to help commuters become more aware of the positive environmental impact of using mass transit regularly.